Curb appeal is a design concept that became popular during the American housing boom of the 90’s and 2000’s. In order for a property to have desirable curb appeal, the property should be aesthetically pleasing to look at when viewing it from the street. Traditionally, curb appeal was used as a strategy to improve the chances of selling a home. However, curb appeal has since been broadened its reach. It is now used to improve the probability of selling all kinds of property – commercial real estate included. Some common curb appeal improvements include repainting a building’s exterior walls and doors, planting seasonal flowers, improving or changing the property’s landscaping, and placing a clear sign that provides a real estate agent’s contact information. Why are these investments important, though? Below are the top six reasons why you should invest in your commercial real estate’s curb appeal. Curb appeal is more than merely improving a building’s façade; rather, an attractive property makes it easier for a client to relax and make a clear-headed decision. Nature elements can help people relax, which is particularly important in commercial environments. One study found that people who looked at roses felt more than 20% less stressed that those who did not. Flora and vegetation can also improve a property’s air quality, which can further improve a property’s first impression: as soon as client gets out of their car, they are welcomed by a pleasant smell and good air quality. Nature encourages a client to relax, which can help them make a purchasing decision. Nature elements can also help a client feel more creative. A psychological study found that participants who viewed plants and greenery felt more creative than participants who did not. A quality landscape can help a client envision how they could adopt a commercial real estate property for their business’s own needs. It will make it easier for them to feel as if they already rent or own the property. Boosting a client’s ability to feel welcome is important, since gaining a client’s trust is a major factor in successfully selling or renting commercial real estate. Millennials are the largest generation in America’s workforce today. Millennials are currently approximately 25 to 35 years of age. As the largest consumer population in America, millennials make up a sizeable portion of real estate consuming power. However, millennials are also the least trusting generation in America. According to a Pew Research Center study, only 19% of Millennials believe that most people can be trusted. Comparatively, 31% of Generation X are trusting of others, and 40% of Baby Boomers are trusting of others. Improving your property’s curb appeal is one way to gain a millennial client’s trust. In order to build a millennial client’s trust, you need to demonstrate that you care about your property and that you value your client. By taking the time to spruce up your commercial real estate’s exterior, you demonstrate that you are a responsible property owner. Curb appeal embraces the belief that first impressions are vital to successfully renting or selling a commercial real estate property. To invest in quality curb appeal is to invest in a strong first impression. By actively improving your commercial real estate’s aesthetics, you are ensuring that clients view your property in a positive light. When looking for a new potential property, half of all real estate clients choose to drive to the location to see it for the first time. If a potential client drives by a property and sees weeds, chipped paint, or a weathered sign, they may not leave with a strong first impression. One study found that 76% of real estate clients believe that first impressions are vital to their shopping experience. By investing time and money into sprucing up your property’s exterior, you can improve how clients perceive your property. Clients want to see attractive properties, and they will be more willing to further consider a property if they see that it is well maintained. While physical first impressions matter, it is also important that your commercial real estate has an attractive appearance online. 66% of potential buyers believe that first impressions online are necessary when considering whether or not to make a purchase. Maintaining your commercial real estate’s curb appeal will benefit both your property’s physical presence and online presence. While curb appeal is important for clients who choose to physically visit your commercial real estate property, designing a visually attractive property will also impact your real estate’s presence online. A study of real estate consumer behavior online found that 80% of respondents use the internet when searching for information regarding potential commercial real estate properties. Within 5 minutes of seeing a commercial real estate property online, more than 3 in 10 potential buyers make a decision to buy the property. People tend to make judgements very quickly, which is why curb appeal is vitally important to the potential sale of your commercial real estate. Pictures of your commercial property will make a large impact online. Curb appeal maintenance must be a consistent task, however. If the online pictures of your commercial real estate do not match the property’s appearance in real life, then a client will likely be less interested in the property. The internet can expose a variety of clients to your commercial real estate, but the opportunity will be wasted if the property is not maintained. While spending money on consistently manicuring a property may seem like a large expense, consumers are actually willing to spend more money on a property that is tidy and attractive. Humans are naturally attracted to beautiful things. Studies have shown that consumers are more likely to spend money if they are in a beautiful space. One study found that consumers are more willing to spend money when surrounded by a neat and beautiful environment. When placed in a clean room and asked to donate money to a cause, nearly 82% of study participants were willing to donate money. Conversely, when placed in a messy room, only 47% of participants were willing to donate money. People feel more generous with their money when they are surrounded by a neat and aesthetically pleasing environment, which is why the exterior of a commercial property needs to be well maintained. Landscaping efforts will subtly influence a client’s purchasing decisions. A study on how landscape affects property value found that over 68% of respondents felt that their decision to rent or buy a property was directly influenced by a property’s landscaping design. Good landscaping not only encourages a client to be more willing to spend, but it also can determine how much a client is willing to spend. Consumers judge the value of products by how attractive they are. A study found that properties with well-manicured landscaping had selling prices that were approximately 7% higher than properties that did not maintain their lawn. 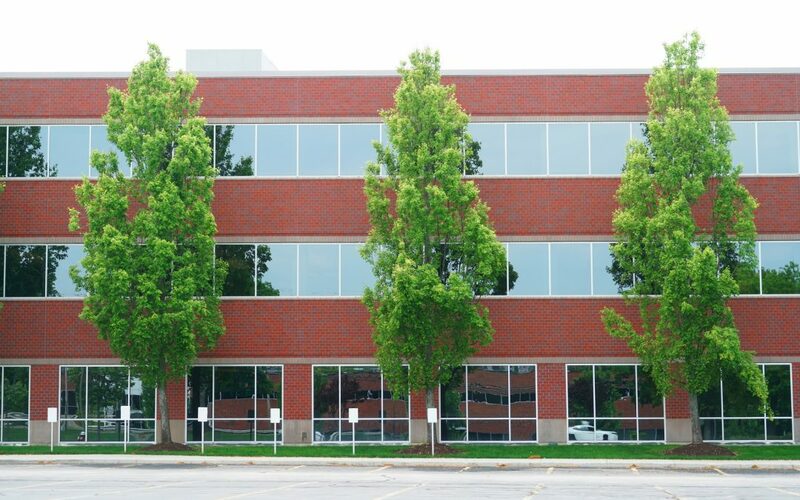 Studies show that maintaining a commercial real estate property’s landscaping has a strong return on investment. Your commercial real estate’s curb appeal matters, because proper landscaping can ensure that a property gets sold. Landscaping will not only increase the value of your property, but also it will see that your property is sold or rented out more quickly than competing properties. A University of Washington economics study found that commercial office buildings that have excellently maintained landscapes have rental rates that are 7% higher compared to non-landscaped commercial office buildings. Investing in curb appeal will ensure that your property obtains tenants more quickly. While curb appeal requires consistent maintenance, you will not have to invest in that maintenance for long, since your property will have a higher chance of selling or renting out faster than non-maintained properties. Curb appeal does not only benefit residential properties: a manicured landscape can improve the aesthetic appeal of commercial real estate as well. Taking the time to consistently maintain your property will be worth the investment. Clients will feel welcome when they visit your commercial real estate property. By being surrounded by nature elements, they will feel encouraged to relax and envision themselves already renting or owning your commercial space. Curb appeal also allows you to build trust with your clients, particularly millennials. First impressions are the essence of curb appeal, and with a beautiful building comes strong first impressions. Good landscaping will make it easy to show off your property online, which can allow you to reach more potential clients. Clients who find your property attractive will be more eager to buy or rent the property; additionally, clients will be willing to spend more for your property, since quality landscaping can improve your property’s perceived value. Curb appeal is vital to your commercial real estate’s success on the market. The investment in sprucing up your building’s façade will be well worth the cost.